This is my ‘famous’ recipe for the prefect minestrone, the best meal for any rainy day! Start off by chopping all the vegetables into small cubes. Add the chopped onion, celery and carrots to a pot and cook with two spoons of olive oil on low heat for 5 minutes. When the leaves of the celery look soft, add zucchini and leek, stir, and let it cook for another 5-8 minutes. Add the potatoes and keep stirring, adding salt to your taste and the half glass of wine. Stir well and let cook until the wine has evaporated and the vegetables look soft. Cover the vegetables with plenty of boiling water and add a vegetable stock. Let cook for 15 minutes, then add a table spoon of tomato paste and two sprigs of rosemary (tie them up with string or the leaves will go loose and be annoying when you eat). 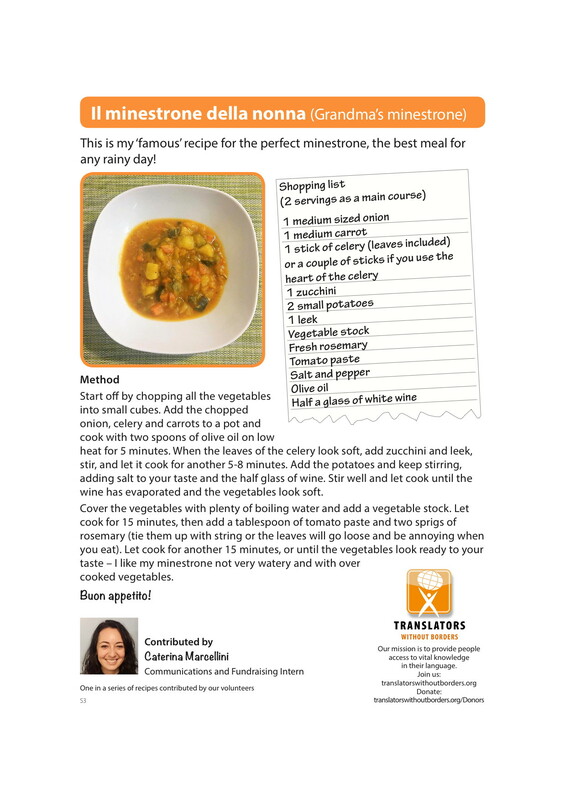 Let cook for another 15 minutes, or until the vegetables look ready to your taste – I like my minestrone not very watery and with over cooked vegetables. Buon appetito!